In areas such as here in flatland San Diego we don’t receive a lot of cold. We’re growing both tropicals which don’t want the frost, and stonefruit, brassicas and other plants that do better with a good chill. So when frost comes we need to manipulate it. 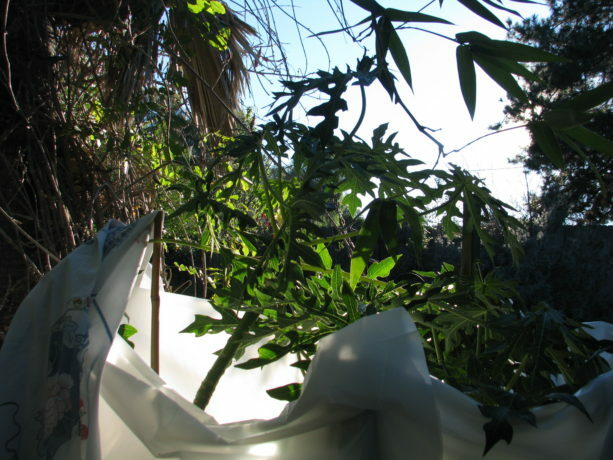 For young tropicals, some frost protection through the first winter is important. A very easy way to protect your trees is to set four stakes around the tree; the poles should be taller than the tree. As much as I don’t like to use plastic, a 6 mil white plastic works best for this. Otherwise wrap in heavy burlap, blankets, etc. The thing about white plastic is that it lets in light so that you can set this up at the beginning of the cold season and leave it up until after the last frost. I open and close the top just on nights when it is going to be frosty. Wrap the plastic around the poles, allowing some to be on the ground in a skirt which you can hold down with rocks, and some to extend above the top of the tree. Staple the plastic to the wooden poles. Frost rolls across the ground like water, so you want to make sure that it can’t roll under your plastic. It also comes down like water so you want to protect the top leaves. 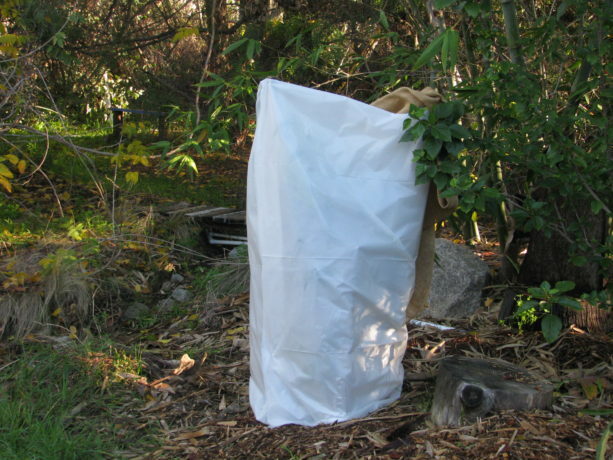 You can have a plastic flap that you can secure – tie down if its windy – over the top. 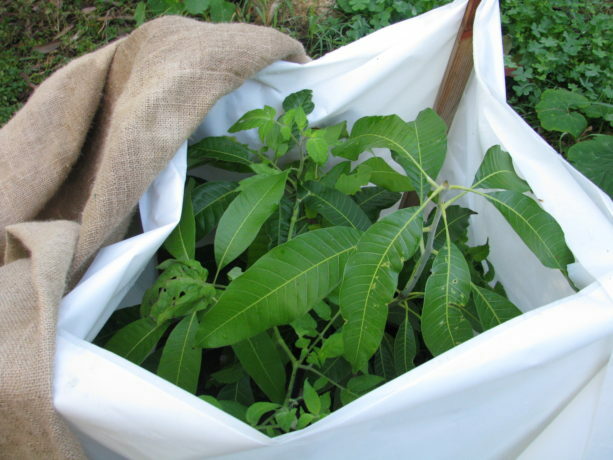 I used several layers of burlap on my mango and rose apple trees, and I’m using an old sheet on my papaya, as if that frosts at the top it will come back the next year, and I didn’t have poles tall enough to reach above the highest leaves. Burlap, particularly wet burlap, would be too heavy. 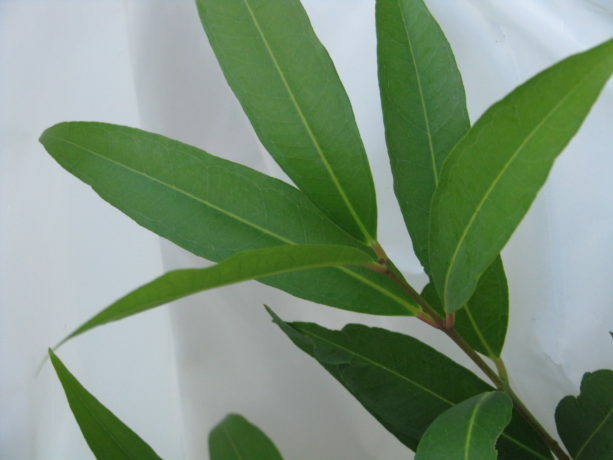 Be sure to uncover the tops of your plants in the morning so that they don’t cook. 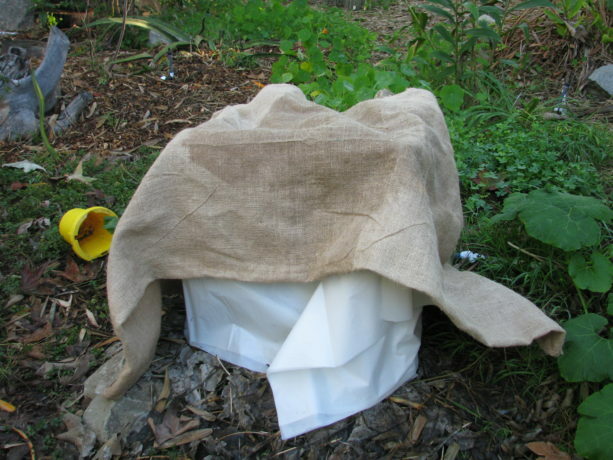 The plastic will act like a small greenhouse and help your plants keep cozy during cold days as well. This is a treat for a tomato that came up next to our mango and is enjoying the greenhouse effect. So what to do about capturing cold? Again, frost rolls downhill. Capturing it with obstacles such as earthen walls, stacked sandbags, bushes, railroad ties, or anything that keeps it from passing by will help deliver the chill hours needed. Be sure that the cold trap is created like a smile downhill of the plant; fishscale swales are in the same direction but placed above plants for water catchment. You want the cold to be caught in a cup. This short video I took last week on Christmas day showed a very light frost, and how dramatically different it was between a path that had no obstacles, and the side that had. After I shut the camera off I realized that I should also have wished you a Happy Hanukkah, an early Happy Kwanzaa, a general Happy Holiday for others, and now I wish you a Happy New Years, as we are five hours before the end of 2016. Thanks for reading, thanks for doing permaculture and helping to save the planet. We can make the change we want to see happen. 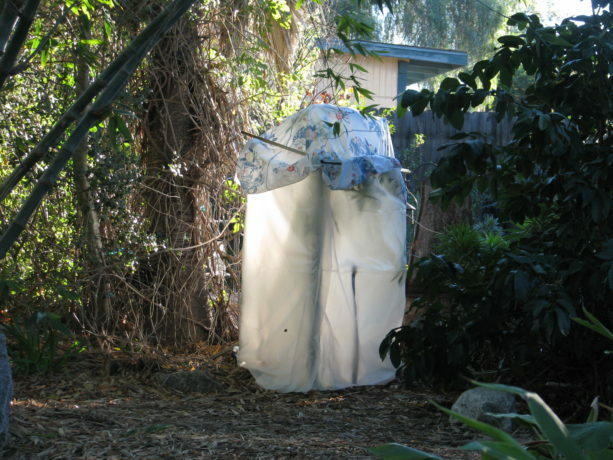 This entry was posted in Frost and Heat, Gardening adventures, Permaculture and Edible Forest Gardening Adventures, Vegetables and tagged Chill Factor, Edible Forest Gardens, Frost, Permaculture, Tropicals. Bookmark the permalink. ← Swales and Basins in Action!